Depending on the number and type of animals you wish to keep in Ipswich, you may require a permit. Permits are issued by Council to ensure animals are managed appropriately and responsibly, for the benefit of the animals, owners and the wider community. Permits and/or licences allow the ownership and management of the animal to be registered with Council to assist Council's civic obligation to the Ipswich community in the promotion of residential health, well-being and environmental responsibility. Council issues standard permits and non-standard permits for animals. Application for a non-standard permit is required when the animal owner is unable to comply with the conditions of the standard permit. A non-standard permit is more expensive as it requires an inspection of the property by Council. Permit fees must be paid at the time of permit lodgement - these fees are non-refundable. If any animal causes a nuisance the keeper may be liable for an on-the-spot fine or be required to remove the animals from the property. See our Quick Reference guide for a list of permit/licence requirements for keeping animals in Ipswich. 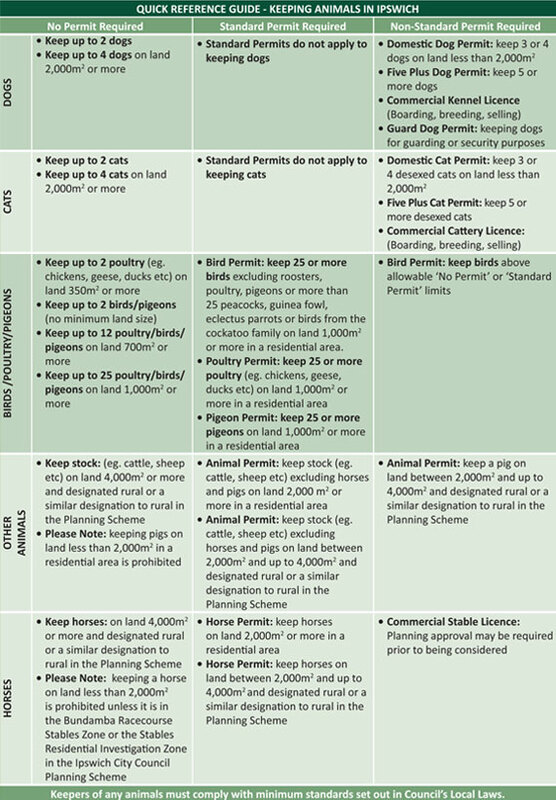 Prior to making application, Planning and Development assessment is required for all commercial activities (this is any activity other than domestic - may include large scale hobbies), a Commercial Kennel Licence, Commercial Cattery Licence or Commercial Stable Licence, any Non-Standard Permit for cats or birds or the keeping of any animals under the Other Animals section. A licence is required to operate a pet shop in Ipswich and the applicant must have approval under the Ipswich Planning Scheme 2006 to operate a commercial business selling animals. It is recommended before you apply for a licence, you contact Council's Planning and Development Department on (07) 3810 6666 to obtain further information. The licensee must comply with conditions for keeping animals on commercial premises in accordance with Local Law No. 3 (Commercial Licensing) 2013. Council has an obligation to ensure that Ipswich is a safe and healthy community. To achieve this there are a range of laws and regulations relating to animals and pests. Local Laws are provided by Council to assist owners to look after their animal/s, and to promote ownership responsibility in the protection of our local environment. All animal owners in Ipswich must comply with the minimum standards set for each animal category in accordance with Local Law No. 6 (Animal Management) 2013, regardless of whether they require a licence or not. Copies of the Local Laws are also available for purchase from the cashiers counter located in Council's Administration Building, 45 Roderick Street or Customer Service Contact Centre, 143 Brisbane Street, Ipswich (Top of the Ipswich Ciyt Mall).